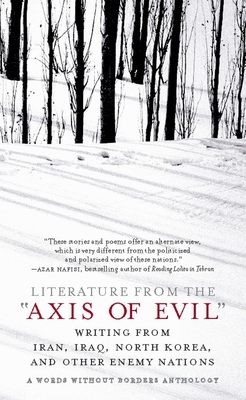 Subject of a full-length segment on Morning Edition when it first appeared in hardcover, Literature from the "Axis of Evil" quickly went to the top of the Amazon bestseller list. Its publication was celebrated by authors including Azar Nafisi and Alice Walker, and the Bloomsbury Review named it a "book of the year." In thirty-five works of fiction and poetry, writers from countries Americans have not been allowed to hear from--until the Treasury Department revised its regulations recently--offer an invaluable window on daily life in "enemy nations" and humanize the individuals living there. The book includes works from Syria, Lybia, the Sudan, Cuba, as well as from Iran, Iraq, and North Korea. As editor Alane Mason writes in the introduction, "Not knowing what the rest of the world is thinking and writing is both dangerous and boring." Words Without Borders is an online magazine for international literature. A partner of PEN American Center, it is hosted by Columbia University and Bard College and funded by the National Endowment for the Arts.